Half Girlfriend is an Indian English coming of age, young adult romance novel by Indian author Chetan Bhagat. The novel, set in rural Bihar, New Delhi, Patna, and New York, is the story of a Bihari boy in quest of winning over the girl he loves. Read More.. Description Half Girlfriend is an Indian English coming of age, young adult romance novel by Indian author Chetan Bhagat. The novel, set in rural Bihar, New Delhi, Patna, and New York, is the story of a Bihari boy in quest of winning over the girl he loves. This is Bhagat's sixth novel which was released on 1 October 2014 by Rupa Publications. The novel has also been published in Hindi and Gujarati versions as well. A Bollywood film adaptation is planned.Dedicated to "non English-types", as Chetan Bhagat wrote, the book divulges the sentiments and linguistic struggles of a backward rural Bhojpuri-laced Hindi-speaking boy from Bihar as he enrolls himself at the prestigious English-medium St. Stephen’s College, New Delhi, and falls in love with a "high class English-speaking rich Delhi girl" schooled at Modern School (New Delhi), New Delhi. 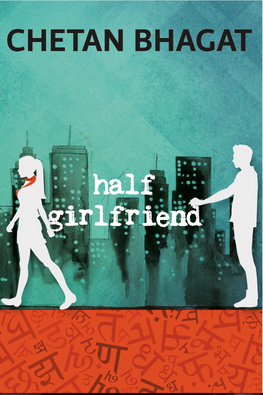 The girl does not admit the relationship but agrees to be his "half girlfriend". Chetan Bhagat commented, "Half-Girlfriend, to me, is a unique Indian phenomenon, where boys and girls are not clear about their relationship status with each other. A boy may think he is more than friends with the girl, but the girl is still not his girlfriend. Hence, I thought we needed a term like 'Half girlfriend'. Because, in India, that is what most men get." Half Girlfriend is an Indian English coming of age, young adult romance novel by Indian author Chetan Bhagat. The novel, set in rural Bihar, New Delhi, Patna, and New York, is the story of a Bihari boy in quest of winning over the girl he loves. This is Bhagat's sixth novel which was released on 1 October 2014 by Rupa Publications. The novel has also been published in Hindi and Gujarati versions as well. A Bollywood film adaptation is planned.Dedicated to "non English-types", as Chetan Bhagat wrote, the book divulges the sentiments and linguistic struggles of a backward rural Bhojpuri-laced Hindi-speaking boy from Bihar as he enrolls himself at the prestigious English-medium St. Stephen’s College, New Delhi, and falls in love with a "high class English-speaking rich Delhi girl" schooled at Modern School (New Delhi), New Delhi. The girl does not admit the relationship but agrees to be his "half girlfriend". Chetan Bhagat commented, "Half-Girlfriend, to me, is a unique Indian phenomenon, where boys and girls are not clear about their relationship status with each other. A boy may think he is more than friends with the girl, but the girl is still not his girlfriend. Hence, I thought we needed a term like 'Half girlfriend'. Because, in India, that is what most men get." No reviews available for #HalfGirlfriend, Do you know Half Girlfriend?, Please add your review and spread the good things.